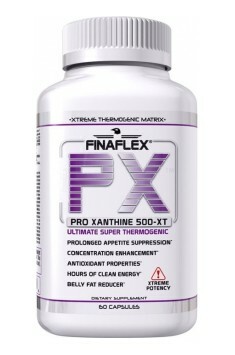 PX® WHITE (Pro Xanthine 500-XT) by FINAFLEX®, the Next Generation in Weight Loss Supplementation. PX® contains the highest quality and most exotic Patent Pending legal stimulants and fat loss ingredients available. One pill provides the ENERGY, FOCUS, and APPETITE SUPPRESSION needed to get you through the day. 2 capsules per day: 1 capsule in the morning before breakfast and 1 capsule half an hour before a workout. Do not exceed the recommended dose. Due to the stimulant, do not use more than 6 hours before bedtime. 2 capsules per day: 1 capsule in the morning before breakfast and 1 capsule before lunch. Do not exceed the recommended dose. Due to the stimulant, do not use more than 6 hours before bedtime. Extreme fat reducer. I know from experience that allows you to get rid of the fat, even the most problematic sites (abdomen, thigh). It contains a blend of proven and effective active ingredients in a perfectly proportioned, so you should stick to the recommended dosage. For best results, we consume 2 capsules daily, at intervals, one in the morning and one before dinner. On a workout days the second portion would suggest not to eat before lunch, and for about half an hour before a workout. Turn up us the process of thermogenesis, so that fat burning will be even more effective. Do not increase the recommended dose. Note - contains caffeine and substances with a stimulant, so you should keep an eye on to take the last dose no later than 6 hours before bedtime. Gelatin, silica, magnesium stearate, titanium dioxide, fd&c blue #1, fd&c red #3.